I finally finished block #2 on HoHRH. That is what I decided to work on last night. I want to try to get caught up and finish block #3 this month! I have also decided to jump on the "Lo How a Rose Sampler" band wagon. I ordered the book from Amazon several weeks ago. I pulled the thread and linen for it yesterday. I have no idea when I'll get to it, but I just love it! The fabric I chose is 32 ct. Vintage Lentil by Lakeside Linen. Well, today is Quaker Christmas day. I'd love to get a couple more motifs stitched on it! Write later! Maybe if I tried again, I would relax into it?? Block 2 is really beautiful! Yes that house reminds me of the house I just finished with all of the mortar and bricks! Takes a long time! but so worth it I am working on this block a bit more then on to my beautiful Quaker Virtues! I too would like to get a couple more motifs on it. I will love seeing your progress on Quaker Christmas!! yeah on block two! I love the colors on Lo How a Rose. I bought my copy of the book last month. :-) I hope to get it done this year. YAY Nicole!!! Completing a block on HoHRH is like completing a project :)..or at least for me it is :) It looks GREAT!!! That fabric for Lo is going to be beautiful. Such a pretty shade of linen. And congrats on Block 2. It looks great! Congrats on the HoHRH progress! I love "Lo..." It's so beautiful! Great progress!! It is really looking lovely! I can not wait to watch you progress on Lo!!! The HRH series is extra fun because we can all celebrate for each block. I love your Lo fabric. I'm using a splotchy fabric and the WDW colors. Can't wait to finish. Congratulations on finishing block 2! Looking forward to seeing your progress on Lo! You are steadily making great progress on HOH. It is lovely. Hi, mi name is Laetitia, I'm french and I follow your blog with great plaisure since several months.You make me discover a lot of wonderfull chart that we don't see in France.For example, "lo,how a rose sampler" it seems so nice, I 've just tried to find it on Amazon, but I didn't succed,I will try another time later. Uh oh! Lo is another project I want to get to! lol! I bought the book a few weeks ago as well. Like minds and all that, I guess! I love how your HoHRH is coming out! Great finish on the next block of HoHRH. I love this new start, I have been watching many people stitch it and it's gorgeous. It's amazing how simply reading other peoples blogs I have become this terrible stash addict. Congratulations on finishing block #2! Woo hoo on jumping on the "Lo" bandwagon. If there's a SAL being organized, I would love to join in! The fabric you chose is lovely. Love your Houses Nicole and I'm not too far behind you in jumping in on the Lo bandwagon. Have the book, have the floss (I'm sure), just need the fabric. Keep up the good work on HoHRH! You will love "Lo". Great fabric choice! The house you've just finished is one of my favourites with all those birds. 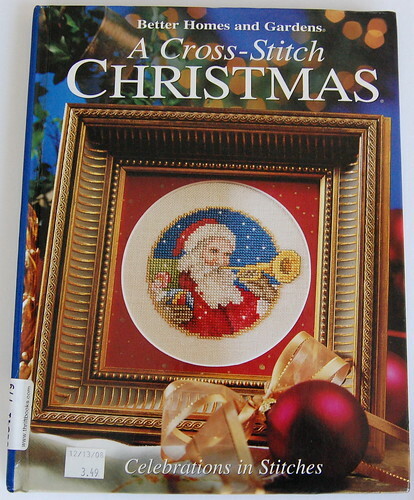 And another LO stitcher. You will certainly love this design as much as the others. Your House looks great! YGG! I love the stuff you chose for Lo, too. 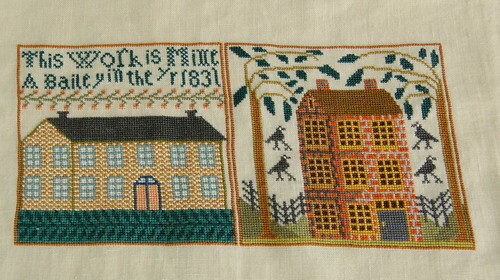 It's such a pretty, soft sampler. Your Titania is coming along great, too. That's great you've completed Block #2, Nicole. The Lo How a Rose Sampler looks interesting too! You are doing a wonderful job on Houses! I need to pull mine out and work on it! I may need to jump on the HoHRH bandwagon now that I've seen your block 2. Something about those colors really appeals to me. Lovely progress on your Houses!! 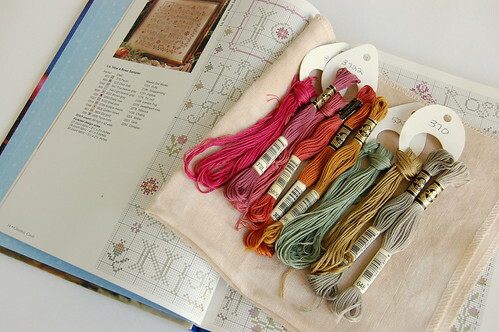 I notice a few other people would enjoy stitching Lo, How a Rose as an SAL - don't know if you were interested in organizing it but I would also love to participate. Great progress on your other projects. I absolutely love the Lo pattern and have finally gotten the book and the floss. I love the fabric you chose, where do you buy the Lakeside? Good job girl!! Congrats on finishing another block!